When ethnic fighters clashed with the Myanmar military in Myawaddy Township last month, most ethnic Karen farmers stayed put, despite fears the army would respond with violence. “They have run away so many times, they are tired of running,” said Reverend Day Bert, the 70-year-old pastor at Myawaddy’s Baptist Church. With Thailand just across the narrow Moei River, Karen people have in the past fled by the thousands, filling refugee camps in Thailand’s Tak province. “They don’t want to go anymore,” said the pastor. Until last month, southeastern Myanmar had seen almost three years of relative peace following the January 2012 signing of a ceasefire agreement between the Karen National Union (KNU) and the government of President Thein Sein, a former general turned civilian reformer. Locals and ethnic armed groups say that the military’s presence in Myawaddy — the main trading point on the Thai-Myanmar border — has significantly increased since September. That, in turn, has coincided with a spate of low-level clashes, the discovery of bombs planted in Myawaddy town, and a deadly mortar attack that claimed four civilian lives on October 11. The sporadic outbreaks of violence have raised concerns about the fate of long-running negotiations toward a nationwide ceasefire agreement with Myanmar’s many ethnic armed groups. Determining precisely who is behind individual incidents is difficult, however, given the tapestry of groups carrying arms in the area. The Myanmar military, known as the Tatmadaw, has a number of large bases around Myawaddy, but shares responsibility for checkpoints in surrounding areas with Border Guard Force units, who cruise the streets at night in pickup trucks, assault rifles at the ready. These guards are mostly ethnic Karen who are given business opportunities by the government in return for their loyalty. Additionally, rebel commanders control small parcels of territory on the border and in the jungle-covered mountains that separate Myawaddy from the rest of Karen State. With bands of armed men from each of these groups engaging in lucrative border trade, territorial or business disputes always have the potential to escalate. The peace began to fissure after the dead body of a soldier from the KNU’s armed wing was found handcuffed by the river in Myawaddy on September 21. Five Border Guard Force troops have been arrested in connection with the murder. A week later, a convoy of five trucks carrying Burmese army soldiers, and a handful of Buddhist monks, was ambushed by a small company of armed men suspected to be from the Democratic Karen Benevolent Army (DKBA), a splinter group from the KNU. The government also announced that five improvised explosive devices have been discovered around Myawaddy town. One was placed at the roadside by the bridge that connects to Thailand’s Tak province, but the crude bomb — a ticking clock wired to some dynamite — was easily spotted by a passer-by, according to local shopkeepers. Then came a mortar attack on a group of travelers who were making their way by 4×4 vehicle through the Dawna mountain range between Myawaddy and the Karen State capital of Hpa-an. Four people were killed, and another five seriously injured. Major Saw Zorro, chief of the KNU’s Myawaddy liaison office, said the attack was suspiciously timed just as KNU chairman Mutu Saw Poe was also traveling in a convoy of 4x4s between Myawaddy and Hpa-an to inaugurate a new liaison office there. But both sides debate whether it was a genuine attack or a setup aimed at further destabilization. Despite the lack of concrete answers, the uptick in incidents may be bringing a new unity to the Karen armed groups. The Karen resistance — representing an ethnic group that includes both Buddhists and Christians — has been divided since 1995, when the DKBA broke away from the Christian-dominated leadership of the KNU. The split allowed the Myanmar army to rout the group’s headquarters at Manerplaw, and the Tatmadaw has since pushed Karen rebels back mainly onto the border and into mountainous jungles. But a statement last week signed by some Karen military commanders announced that they were forming a combined “Kawthoolei Armed Forces,” named for the theoretical autonomous state for which the Karen have been fighting since 1947. Signatories claimed to represent battalions of the Karen National Liberation Army (KNLA) and the Karen National Defence Organization (KNDO) — two armed groups fighting under the KNU’s leadership — as well as the DKBA and a small breakaway group know as the KNU/KNLA Peace Council. The KNU’s political leaders have sought to distance themselves from the statement, but Saw Zorro confirmed that talks on a new united front, although preliminary, were underway. The KNU has also been acting to try to calm relations between the Myanmar military and other Karen groups, he said, in hopes of protecting the national talks that many see as the best hope in years for a political settlement to Myanmar’s ethnic conflicts. 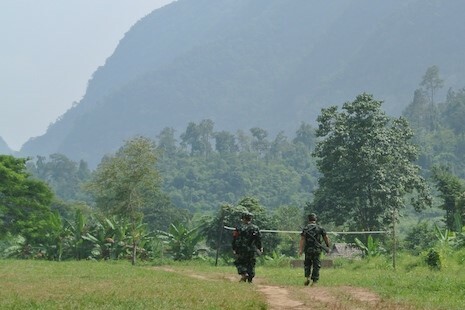 But at the KNLA’s headquarters at Thay Bae Tah, just inside Myanmar on the western bank of the Moei River, military leaders remain skeptical that the government will engage honestly in dialogue over political autonomy for the Karen. Ksha Kalu, a major in the KNDO, told ucanews.com that he thought the recent increase in the Myanmar military’s presence in Karen State was intended to provoke the Karen. With the conflict reignited, he suggested, the people of Myanmar would be reminded of the necessity of a strong military and accept limits on their nascent democracy. But with an eye to a future with peace, a leadership training program is underway at the headquarters to train young officers, emphasizing English-language skills and community organizing. “If we can’t organize the people, we can’t win the war,” said Mahn Robert Bazan, who is involved in the training. The 73-year-old — who now lives in the United States — is the son of former KNU chairman Mahn Bazan. Having fought with both the KNLA and the DKBA, Mahn Robert Bazan said he hoped the Karen would not be divided in the future. Reverend Day Bert said that as the fractured rebel groups move closer together, they are winning more support among ordinary Karen people, who still do not trust the central government. “Even while they talk about a national ceasefire, they [Tatmadaw] move into areas where Karen live. So, slowly the Karen people have less trust,” he said, alleging that more than 81 hectares of the more fertile land around Myawaddy had been seized by the military for its own purposes. As well as an increase of government soldiers operating in Myawaddy, the demographic makeup of the civilian population has also changed. An influx of the mostly Buddhist Bamar, who dominate the higher offices of Myanmar’s military and government, has meant most Karen have not seen the benefits of increased border trade with Thailand. “In the past there were only Karen in this township. But under the military dictatorship many Bamar moved in to make money,” said Reverend Day Bert, who has lived in Myawaddy since 1970. The so-called “Burmanization” of the town is underscored by a pagoda-building campaign underway on the outskirts. A huge spire is currently under construction close to the trunk road out of town, facing another large pagoda that is yet to be finished with gold leaf. Reverend Day Bert is also expanding the reach of the Christian faith, however. He showed ucanews.com around a new Baptist church on a scenic hilltop in Hti Mae Wahkee village, which is five months away from completion. “This is a very beautiful spot, and all around here are Karen people. We want to spread the gospel,” he said. The surrounding hills are a burnt-brown hue as the November corn harvest approaches, giving local farmers more reason to fear renewed fighting. The foundations for the church include a small cellar, which could prove useful, the pastor noted. “When the church is finished,” he said, “people can hide in here if there is fighting”. *This article first appeared on ucanews.com on October 22, 2014.